Likeable Business: Why Todays Consumers Demand More and How Leaders Can Deliver | Free eBooks Download - EBOOKEE! Posted on 2013-11-21, by nobihai. 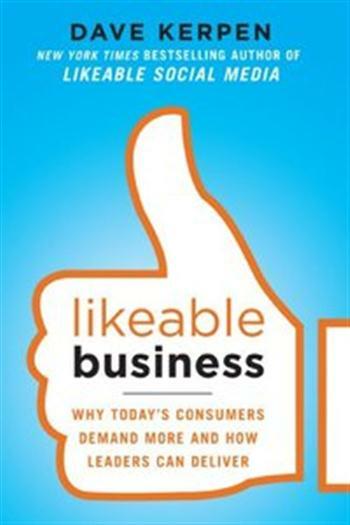 Likeable Business: Why Todays Consumers Demand More and How Leaders Can Deliver Dave Kerpen, Theresa Braun, 2013 | ISBN: 0071800476, 007181373X | 256 pages | EPUB | 3 MB It pays to be LIKEABLE! You can have a rock-solid business strategy, unlimited resources, and the most talented people on staff. But only one thing is guaranteed in todays hyperconnected society: if your business isnt likeable, it will fail. Dave Kerpen knows how important it is for a business to be liked-by customers, employees, stakeholders, and the general public. He wrote the book on it. His groundbreaking bestseller Likeable Social Media changed the way businesses interact with their customers on a daily basis. Likeable Business lays out 11 strategies for organizations of all sizes to spur growth, profits, and overall success. Dave Kerpen reveals the remarkable returns youll get when you gain the trust of your customers and stakeholders. In todays social media world, it literally pays to be likeable. Likeable Business helps any leader at a smallor mid-sized company increase profits and spur growth by applying the 11 principles of business likeability, such as: LISTENING-to customers, colleagues, shareholders-and competitors AUTHENTICITY-because todays savvy customer always knows when youre faking it TRANSPARENCY-honesty builds trust, and any deviation can destroy your reputation ADAPTABILITY-managing change and finding new opportunities is critical to success today SIMPLICITY-in design, in form, and in function GRATEFULNESS-every thank you is appreciated . . . and generates surprising returns! Likeability spreads. As a business leader, you set the tone. Be likeable and your staff will be likeable-which in turn creates a more likeable customer experience. The blueprint for everlasting business likeability is in your hands. Apply Kerpens basic principles day in and day out, and profits and growth are sure to follow. 2018-06-18How Life Works Why Happy People are More Successful. How You Can Be Like Them! No comments for "Likeable Business: Why Todays Consumers Demand More and How Leaders Can Deliver".